For my podcasting setup, I utilize a Mackie Onyx Blackjack mixer. This mixer features monitor outputs, which allow me to run TRS to RCA cables back to the main YU5 speakers. Such a connection allows me to monitor through the speakers, which is very important for my particular application. Another thing that I appreciate about the YU5 is that it features non-proprietary speaker wire connections. 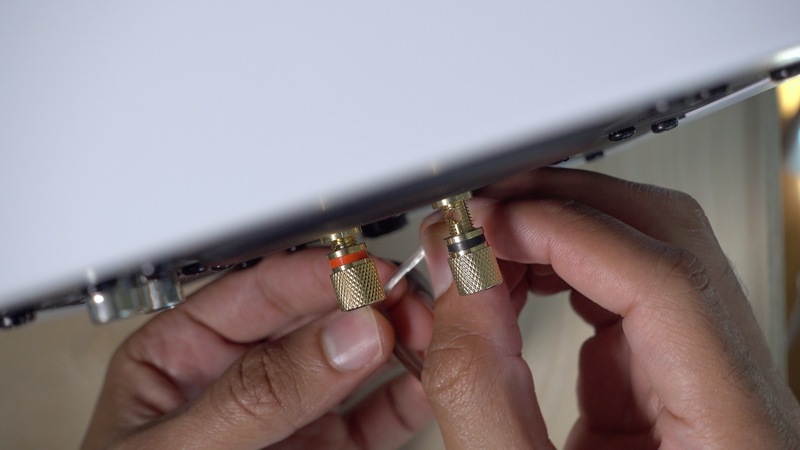 This means that I can use aftermarket speaker wire, although Kanto includes a generous amount, and run the connection at a length that I deem best for my setup. Again, the running theme here is flexibility. 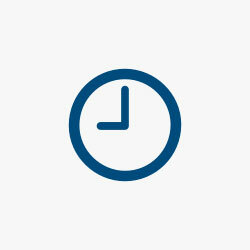 Want more video reviews? Subscribe to 9to5Mac’s YouTube channel. If used as a computer companion, you might consider the YU5s to be fairly large. Each hand-built acoustic MDF cabinet measures 6.8” W x 8.4” D x 10.6”. The weight for the active speaker is nearly 10 lbs, while the passive speaker is closer to 8 lbs. Needless to say, these are large, heavy speakers, so you’re going to need a large desk to accommodate the footprint. Although Kanto makes the YU5 in several piano gloss finishes, I felt that such a finish would look overly gaudy on my desk. Fortunately, Kanto offers several smooth matte options as well, which won’t cause reflections, and appear a tad more low key than their glossy counterparts. I’ve been using these speakers for over a month and I’m satisfied with the sturdiness and build quality. 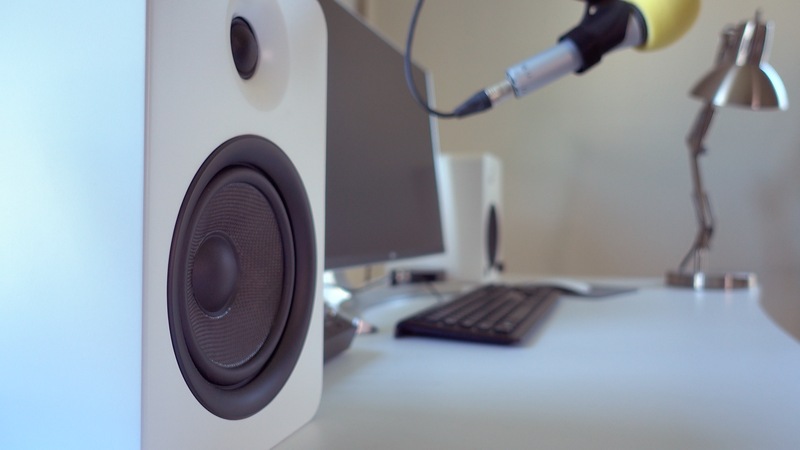 My desk is always being infiltrated by new products to review or configure, and as such, things tend to get shuffled around and knocked into on a recurring basis. I’ve even smashed my microphone boom arm into one of the YU5 speakers, but it didn’t leave any permanent marks or scuffs. I like the look of the YU5 better than the look of the KEF Egg, although the Egg’s design is intentionally meant to be an artsy conversation starter. I’m a more traditional person when it comes to design-sense, and prefer the simpler look of the YU5. Of all of the YU5 cabinet colors, I think that the white matte looks the best (the matte black looks scrumptious as well). The white especially pops thanks to the black 5.25″ Kevlar driver. It looks modern without being over-the-top. Even the rear of each cabinet looks good, with its 2″ rear bass port and Kanto YU-5 logo written in white on black MDF. It’s a no-nonsense look that lays out all of the various connectivity options in a well-arranged manner. If there’s one ding that I can make against the Kanto YU5’s design, it would have to be the remote control. Whereas the YU5’s speaker cabinet design looks modern, the remote control looks like something that came straight from the early 90’s. The YU5 is powered by a class D amp in its powered speaker, delivering 40W per speaker. Each speaker features a Kevlar woofer and a 1” silk dome tweeter for the highs. The 2″ bass port increases bass response efficiency, and most will likely be satisfied with the lows produced by these speakers alone. 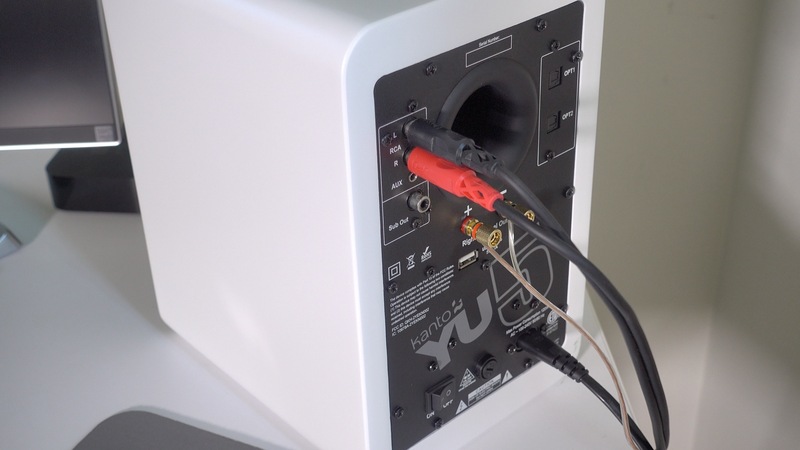 If you’re looking for additional bass, you can connect a subwoofer via the YU5’s sub output. Kanto sells a subwoofer specifically made to pair with its speakers, but you can connect any powered sub via its output. The YU5 gets very loud, and can easily fill up a moderately-sized living space with sound. At higher levels, you will hear some distortion, but that’s to be expected for powered speakers in this price range. Highs and lows can be adjusted via the bass and treble settings on the YU5’s remote control. Midrange, while affected by these settings, isn’t as clear as my KEF Egg. Again, that’s to be expected given the price difference and KEF’s almost obsessive focus on sound quality. The YU5 can connect to multiple Bluetooth devices as well, and all it takes is a press of the Bluetooth reset button to easily switch between already-paired devices. Despite its antiquated design, the remote control provides a wealth a functionality. It can be used in concert with Bluetooth connections to play/pause, skip, and go back to previous tracks. More importantly, the remote can be used to adjust volume, treble and bass settings, balance, and mute. The remote even features two reset buttons to quickly set the bass and treble settings back to default levels. The YU5’s remote certainly isn’t the prettiest thing to look at, or the easiest remote control to use, but it does a good job of providing a variety of sound adjustment and input switching settings. 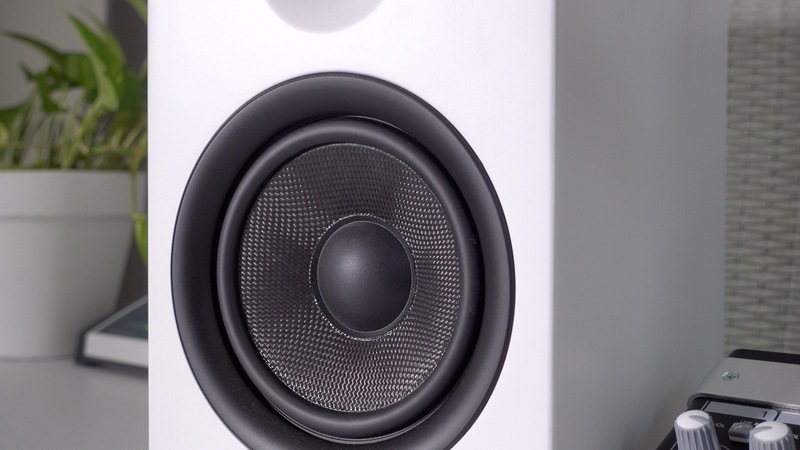 The YU5 by Kanto is a medium-sized powered bookshelf speaker with an adequate helping of input and output options, wireless Bluetooth connectivity, and plenty of power to drive the woofers and tweeters to very loud levels. I find that these speakers, with their flexibility and good looks, make a great companion for my podcasting and voiceover setup. 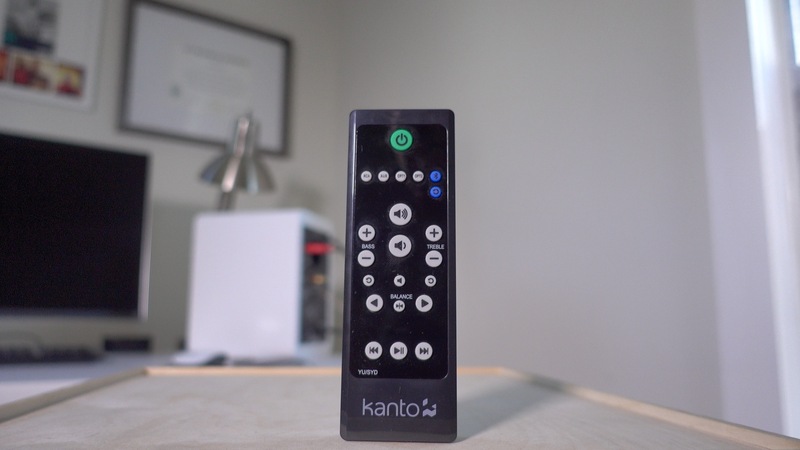 If you have the room on your desk, and you’re in the market for something new, then you might consider the Kanto YU5. The speakers come in a variety of piano gloss and matte colors, and can be had for around ~$350 or less on Amazon.